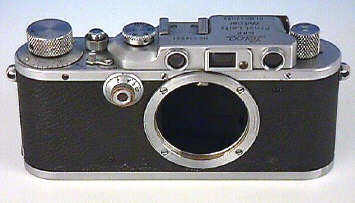 Among the rarest and most sought after Leicas are the Luftwaffe, cameras issued to the Nazi Air Force. 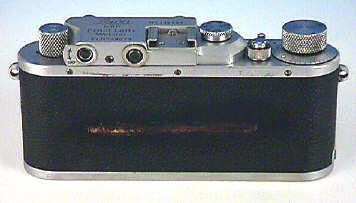 The large majority of such cameras are chrome IIIc's, although a few III's, IIIa's and IIIb's have also shown up. A few have also shown up in Grey with a MOOLY motor. It's been said that several thousand were made for the Luftwaffe, but about 10,000 are for sale! A good engraver can easily add the necessary inventory Fl Number, and "Luftwaffen Eigentun" as well. Beware of fakes. Over the last few years, the Russians have made a cottage industry out of fake Luftwaffe cameras with all kinds of bogus markings. 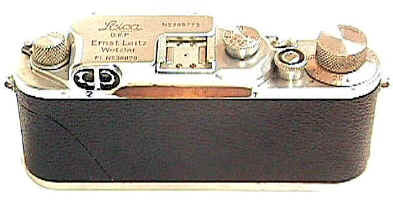 This are easily spotted as fakes if you know Leica -- but a lot of unsuspecting folks thought they were the real thing. After the war MOST Luftwaffe cameras seem to have had their LUFTWAFFE engravings defaced -- anything reminding people of the Nazi's was not especially popular. The cameras illustrated on this page are so defaced. Unscrupulous sellers regularly buy plain wartime vintage IIIC's, probably to engrave them with Luftwaffe or other military engravings. 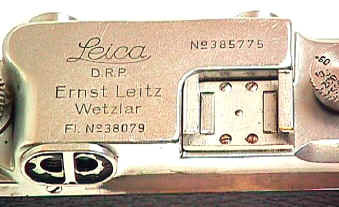 Before you waste your money on a real Leica with fake Luftwaffe engravings, check with Leica to make sure that camera was delivered to the military. This Luftwaffe probably had the Luftwaffen Eigentun engraving on the back of the top plate. This camera presumably the rear vulcanite had the Luftwaffen Eigentum embossing at one time. Notice the marks in the middle of the vulcanite on the back of the camera, running lengthwise. Unlike most Luftwaffe, however, we know this one is for real. It has been documented by Leica as being delivered to the "Berlin Air Force" on August 24th, 1939. 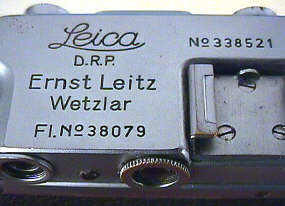 Luft Leicas are hard to find, the original Luftwaffe cases seem to be even rarer. The "Luftwaffenegentum" stamping is indeed in the top of the leather case, though it barely shows in this photograph. 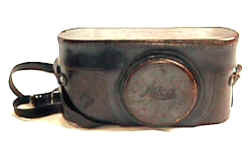 Note the case for collapsed lens, indicating the original lens was probably a 50/3.5 Elmar.